Jorge Federico Osorio Interview with Bruce Duffie . . . . . In the course of doing interviews for about thirty years, I am pleased to say that each one is unique and has special qualities. At the same time, a few generally-accepted ideas emerge, and one that tends to rise to the top is the lament by many guests about the lack of music in the elementary and secondary schools. Around the country — and even around the world to some extent — the musical education of the general population seems to have been pushed out of the curriculum. Whether due to time constraints or budget considerations, administrators have taken the easy route of lopping off music and art in order to save something. Little do they realize that these savings will result in a huge loss for society, but that is fodder for a whole other discussion. I bring this up because there are a few major noteworthy performers who try to fill the gaping holes with in-school performances and other exceptional ways of bringing this rewarding side of life to eager young minds. Jorge Federico Osorio is one such visionary. As usual, details about his life and career can be found in the box at the end of this presentation. When we met here in Chicago in the summer of 1994, he was finishing up a busy day filled with these special appearances . . . . .
Bruce Duffie: You just came from playing concerts for young people. Tell me the joys and sorrows of playing for younger audiences. 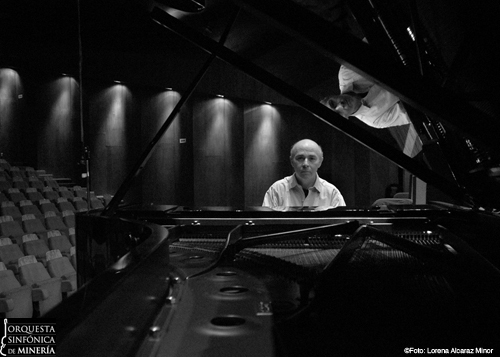 Jorge Federico Osorio: This morning I played for a very young audience. There were maybe sixty kids there, all with their programs waving all the time I was playing! BD: Oh, to keep them cool? They were using the programs as fans? BD: So they used them as fans, but did they become “fans” of piano music? JFO: Maybe some of them, yes. You never know with kids. Sometimes they seem they’re not really there, but they’re so aware of so many things. It’s just a matter of how you present things to them that really matters. And that’s what they sense; they feel if you’re really doing it because you really feel intensity about. You can’t fool them! BD: I assume you wouldn’t want to try and fool them. JFO: No, no, no. I don’t mean “fooling.” Many people have this attitude that you just play it without feeling because they can’t really grasp subtleties. But everything is really for each individual to decide. BD: Is the change between an adult program and a children’s program the selection of repertoire rather than in the performance practice? JFO: Yes, but I’ve had very mixed experiences with that. Sometimes you choose a program that you think is really for children, and then suddenly things change. I had experiences in Mexico playing in schools — a Prokofiev sonata with all this rhythm and all this percussive style — and they just loved it! They didn’t want just the Twinkle, twinkle little thing! [Both laugh] You know what I mean. BD: They wanted something a little more invigorating? JFO: Yes, exactly! That Prokofiev is a very unknown piece for this type of public, and they really enjoyed it! I remember also playing a Bartók sonata once, with all these rhythms and all this coloring and my sweating there, and I know that they enjoyed that! BD: Can you be more adventurous with young people? JFO: Yes, why not? They’re really open to everything, and in a way they’re not so spoiled. BD: How can we get the older audiences to be more adventurous? JFO: They should make the effort. [Both laugh] So that was this morning, for these kids. This afternoon I went to a music school. They just weren’t for families or adults. It is very interesting and very, very rewarding to play in these places. BD: Every time you go to a new place, you encounter a new instrument. How long does it take before you make that instrument your own? JFO: Sometimes it takes just a couple of minutes. It depends how it goes. Sometimes you get a wonderful instrument that immediately is like an old friend, or it’s immediately like someone new that is really talking to you in a new language. Sometimes it’s an enemy for life! BD: I hope that’s not too often. JFO: Luckily, no. But that’s the fate of pianists. On the other hand, we don’t have to carry any instrument. Sometimes I play with a friend of mine that’s a cellist, and we go with his instrument. I don’t have to deal with that. I get all these wonderful surprises, and then maybe not so good in others. But that’s all right. BD: Do you spend more time getting acquainted with the instrument if you’re playing a full recital, as opposed to just a concerto? JFO: Sometimes. It’s really getting acquainted, sometimes, not so much with the instrument but with the place and the acoustics, and what you’re going to do. I don’t think that much, really, of the instrument because if you start really working on what you want the concert to be, automatically you are adjusting with the instrument. You’re really not aware that you’re searching. Or if it’s a new instrument or an instrument that you don’t know, it’s more or less quite immediate. BD: Are there are times when all of a sudden it just seems like the instrument and you are one? JFO: Yes, that’s the idea, really! You’re not thinking about it. It’s just really trying to convey the musical meaning. BD: When you’re playing the piano, how much is the music, and how much is just the technique of playing? JFO: The technique has to be there, like the means for the end. That’s for the artistic end. At the time of the performance, I try not to be aware of any of that; that’s really the work I have to do previously. I have to be ready. It’s like an actor knowing his lines. It doesn’t matter how much feeling he has for the work if he doesn’t know what to say; then he’s lost, and the same with the music. BD: So the music tells you what to say, but you still have to decide how to say it? JFO: Yes. That’s the way to interpret. Not every time, but you more or less know the work you are going to perform. You must have an idea of what you want. All the preparation enables you to be freer at the time of the concert. Maybe new ideas come; the music should sound fresh — that’s really the important thing. BD: If you’re playing a concerto soon that you have played last year or a couple of years ago, do you start from scratch and re-learn it or do you just build on what you have already done? JFO: As an artist, as a human, you’re changing constantly. So every time the work changes, I think. It’s not that you want to change the work, but it’s just the way you see it. You see new things; you see things sometimes in a more mature way. Sometimes you realize that maybe your tempos really weren’t what you wanted, or it’s not at this moment what you think it should be. It’s not that it wasn’t a valid interpretation before, you understand. Sometimes it’s difficult to get to the objective. You always think that what you’re doing is really the best thing, and sometimes you hear a recording of a previous performance and realize that maybe it was not too bad! BD: Is there such a thing as an ideal performance, or even a perfect performance? JFO: I don’t think so because music lives in that precise moment. So really, perfection would be trying to catch the essence of the work every time and for me it is more important to seek perfection that you never attain. But that should be your aim. BD: You are always striving for it? JFO: Yes, striving for that. BD: Do you strive from different angles, then? JFO: Personally, I always strive from the score, to see really what is there, what is written between the lines. That’s what I really try to do, because that’s my job as an interpreter. BD: Do you ever feel that in a live performance you’re competing against your own recording of that work? JFO: No, never. Sometimes you think it would have been nice to have this moment of performance in the record. But sometimes things happen just once or twice, and you can’t put them on a record. It doesn’t work; it’s just that precise concert, that evening, that it happened. BD: Do you ever feel you’re competing against other pianists, the shades of Horowitz or Rubenstein? BD: The things that you’re thinking about — are they different when it’s a solo recital as opposed to a concerto? JFO: No, in a way it’s the same. For a recital, sometimes the preparation is different. You go through so many different moods within the works and everything that you perform. You have to build up and change from one piece to another and from one composer to the other — sometimes suddenly — which you don’t in a concerto. But essentially for me it’s about the same. Although I like both experiences tremendously, I especially like the recital. I like to be on my own there with the piano. It’s a wonderful feeling! BD: You are the show, as opposed to a concerto, where you have others being also part of the show. JFO: Mm-hm, mm-hm. Also playing chamber music is very important for me; it’s very exciting. It’s not that you’re not as free as in a recital, but you have to be aware of what is going on around you with really acute listening when you’re playing chamber music. BD: Do you get much opportunity to play chamber music? JFO: I try as much as possible. BD: Good. I’m glad, because that’s very important in a career. And it’s very important for your musical health. JFO: Exactly, yes, because you get someone there who is really listening to you also, and very critically. It’s enjoyable, but also you’re learning constantly from the others. BD: From the vast array of piano literature, how do you decide which pieces you will learn and which pieces you will put aside? JFO: That’s a good question, because, as you say, there’s so much and it’s so vast, so rich! Sometimes I spend just too much time trying to decide. I am reading through scores and I don’t get to learn something. It depends on what I’m playing and what I’m scheduled to do. Sometimes there’s a work that just comes, and I decide on the spot, “This is what I want to do.” For instance, when I was very young I wanted to learn the Brahms D Minor, so for me there was no other concerto that existed at that time. I just had to learn it. So things like that happen. And sometimes people ask for certain repertoire, things that you hadn’t contemplated. Then you really become fascinated by this, just by discovering things like that. BD: Are you known as a specialist in any one area? JFO: Not as a specialist. I don’t call myself a specialist or anything like that, but in certain parts of the repertoire they know me a lot because I play a lot of Brahms, Debussy, things like that. BD: Do you also play new scores, new music? JFO: I don’t play contemporary music, no, but I do play new scores, yes. There’s some Mexican composers that I play. There’s one in particular, Jiménez Mabarak, which is a wonderful composer. His music is not contemporary; it’s not that type of language. But I enjoy his music tremendously. BD: Tell me about the musical life of Mexico. JFO: In many ways it’s very rich. Traditionally, music has been very, very important for Mexico. There are wonderful voices in Mexico; there’s always this element of singing, of expressing yourself by singing. Mexico City has four major symphony orchestras. There is not a symphony orchestra in all the main cities, but in most cases, yes. Still, there are many parts of Mexico that would need a richer life. Sometimes there are periods when they have a lot of music that comes when they make a festival here and there. Then everybody gets excited and they put up a lot of money. Then the next government comes in and that disappears. What would be ideal would be some kind of continuity towards the musical education in Mexico, really starting from the kids to expose them at a very early age. Just to let them listen and naturally let them decide whether they like it or not — not to put a label on it that this is classical and it’s unapproachable or elitist or anything like that. BD: This is just music. JFO: Just music, exactly. Mexico is a country of really tremendous contrasts, and it lacks in many, many fields. I guess music wouldn’t be really a priority now, but little by little it could be done, just certain little programs put here and there. That much; it’s very important. It’s a very young country — that is there’s so many young people. Potentially that’s the new public, so it has to be educated and exposed to music. BD: Does it give you a sense of pride to play in Mexico — in Mexico City and in other places? JFO: Yes. Oh, yes, I love to go to Mexico! It’s a wonderful public, very warm. And in a way it’s very rewarding for me because I go very often. And it’s very challenging because every time I go on the stage it has to be better! BD: Do you get enough opportunity to play in Mexico, or are you touring all over the world too much? JFO: No, I do go back fairly often to Mexico. In that respect, I’m very glad. BD: Let me turn the question around. Does it give you a sense of pride to take the Mexican culture to other countries of the world? JFO: Yes, absolutely! As a Mexican, I am playing not just the traditional repertoire, but also playing Mexican music. Lately I’ve become very interested in the music of Manuel Ponce. I have some recordings of piano music that as far as I know is the first recording of piano solos that’s available abroad. It’s mostly the guitarists who have profited from Ponce’s music, but for piano there’s much, much more. His literature is tremendous. He has a wonderful piano concerto as well as chamber music — trios, sonatas. There’s a lot to be discovered there. BD: Now you have this close connection with him and a couple of others, do you make sure you take these pieces around with you? JFO: Yes, I do, yes. I premiered his concerto three years ago in London and people loved it! It’s a wonderful work, very Lisztian and very romantic, but beautiful music. BD: Is there any conflict between Spanish composers and Mexican composers, or is there a special affinity between the two cultures? JFO: Of course there’s affinity because of the culture where everything has been happening in the last five hundred years! Certain composers were very much influenced by Spanish composers and music. At one time we had so many Spanish intellectuals coming to Mexico; at that time in Mexico, it was a strong influence on so many people in so many areas. But in the end, I think Spanish and Mexican music are very, very contrasting, very different. JFO: The Mexican music has really gone back and tried to find the roots in pre-Colombian music. The rhythms and all that are much more wild. It’s much more raw, the Mexican type of music. Raw from the guts. On the other hand, I was thinking about Spanish music and they also have this gutsy feeling. There’s some places in the pieces I play that are so dramatic, and also the drive of the rhythm is tremendous! So I guess there are similarities. In this world, in this language of international music, you always find something. That’s why we all are here, and try to communicate that through music, because in a way, we can all understand through music. BD: Is this, then, the purpose of music? JFO: You want to express, and some people find that maybe it is easier to express their ideas through music. Some other people would find it through painting or through acting or writing. I think through art in general, the individual really seeks to express himself, to grow, and maybe to bring joy to other people. Life is to be enjoyed! BD: What advice do you have for audiences that will come to hear your concerts — or other classical music concerts? JFO: I really never like to give advice like that! I hope that they would come and just hear it with fresh ears, just to enjoy the moment, and to concentrate. They used to ask me what advice do I give to younger kids and to other people who haven’t really attended many concerts. I tell them music is an experience. It’s not something that you just go there to relax and enjoy. Music is really something much more intense, something much meaningful. So I told them to just put all your senses into it, and really try to listen with more attention. We are bombarded with so many things around that it’s difficult now to get the attention of the younger kids, especially. Everything is just visual on TV and videos. Sometimes they forget to focus just on listening. BD: Where should be the balance between enjoyment and the focus of intelligent listening? JFO: When music brings you a lot of enjoyment, everything becomes more acute. I think that would be rewarding for them. BD: Do you do any teaching, and if so, what advice do you have for your students? JFO: I do some teaching, yes. Not very much, but I do. I had a class in Mexico at the National University, and I do some private teaching in London. 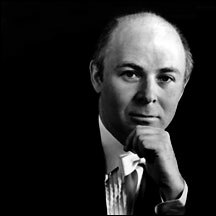 For pianists, I think the main thing would be really to try to listen as much as possible to all the masters — all the pianists — because they had so much and still have so much to say in terms of respect for the music and for individuality. All of them have their seal and are really great interpreters and great masters. Also to do a lot of chamber music, and try to get away from making this instrument so percussive; try just to make it sing. Listen to singers. Go to the opera and listen to a lot of lieder recitals; things like that just to enrich yourself. Be there with your piano, but for the love of music not for the love just for the piano. At such a young age, one would tend to just be submerged in your instrument, and forget about so many other things that are very important. BD: You’ve made a number of recordings. Do you play differently in the recording studio than you do in the concert hall? JFO: I always treated the recordings as performances. Nowadays you can do just anything, split here and there and put together a performance that doesn’t mean anything! Actually, that’s something that I’ve thought of very seriously because it’s very tempting to just bring a perfect product which doesn’t say anything. A few months ago, someone that I know gave me his latest record. He told me, “Well, here it is, and half of it is dead because you know how it is in a recording.” And I said, “That’s not really what I want.” In recording, you aim to make it like a performance, and really go as if you were in a concert. You try to catch something like that. JFO: Sometimes you do! It’s very tricky, this business. I think recording in the older days was a better way because you came and performed, and that’s it! BD: [Laughs] Oh, you mean the age of the 78’s? JFO: Yes. Still the greatest performers are from that time, in my opinion. BD: Greater than they are today? BD: Are we not making some kind of improvement as we go along? JFO: No, I think just that it’s changed. It just happened that at that time there were so many; something might have been in the air or in the mind of all these people and the way they performed that made them play like that. It’s so wonderful. Also, life has changed so much. They didn’t have to travel the way we do. They had more time to think about things. The communications weren’t as wonderful as now — which, in a way is wonderful, but in another way where you wonder if it is really necessary. BD: You don’t want to be beeped anywhere you are? BD: I can just see that — in the middle of a concert, you’re playing, and all of a sudden your agent beeps! JFO: Yes, can you imagine! Technology is wonderful, but there has to be a balance with all that and with your way of life. BD: When arranging your life, do you make sure that you schedule enough times off, some vacations, some rest times, some learning times? JFO: Yes. Yes, I try to, always. And I try always to have something new to learn because that’s something I need to be fresh. And that also helps the older repertoire. Sometimes I try to schedule it, and it’s not always possible, of course. But as much as possible, yes. I don’t like to just lead a life of work and be constantly on the road, not being able to do other things that are important — family, kids, friends. When you go to other countries and other cities, at least have some time to spend there to get a feel of the place, which is important. BD: And make new friends? BD: What advice do you have for someone who wants to write music for the piano today? JFO: I don’t know that. [Thinks for a moment] I never thought of that. It never occurred to me. If I would ask someone to write, it would be someone that I would respect as a composer. I don’t think I would tell him how to write. BD: So it would someone who already knew how to write for the piano? JFO: Yes, yes. On the contrary, I would like maybe to be surprised by it. That would be more interesting. BD: How far back do you go in music? Do you play some Bach and Scarlatti? JFO: Yes, Bach, of course. Scarlatti, yes. It’s from then on, really, that I play. BD: All on the modern piano? JFO: On the modern piano, yes. I enjoy his music tremendously on the modern piano! BD: Do you have any feelings about people who insist on doing it only on the old instruments? JFO: It’s interesting, but I’m not that convinced by it. I think it sounds so expressive on the piano. That’s just the way I feel. I don’t think I would go and get myself an instrument just to see. We really don’t know, really, what was in their minds. At that time, those were the instruments that were available, but it’s not to say that they were stuck with that! I think the music is much greater than that. It transcends all that, so it’s fine with me to play Bach on the piano. BD: Is that what makes his music great, the fact that it can transcend all of these changes of time? JFO: I think so, yes. Like Beethoven, also. In his last sonatas you really get a feeling that he was searching for something new, something he was really trying to get out of there. And when you hear these on instruments that were there when he was alive, I don’t think it has the same impact. I’m not all that for it. BD: Perhaps it doesn’t have the impact on us because we’ve heard the big, new pianos. JFO: Yes, but he couldn’t hear anyway! [Both laugh] Everything in his message was more transcendental. That’s why I think he’s so popular all the time. Beethoven’s message always transcends; whatever happens, it will be there. BD: One last question — is playing the piano fun? JFO: Yes, it is. Actually, this is a question that someone asked me at the outreach recital I did. They asked me, “Is it work or is it fun?” Of course, I tell them, while you’re performing, it’s not that it’s fun, but it’s another type of enjoyment. It can be fun, of course. I love practicing. I love really being in music, and this is my life, so in a way it is fun. It depends also what you’re playing. BD: How much time do you practice every day, on average? JFO: Average, I try to do three or four hours — sometimes more. BD: Are there times when you just get completely away from it and don’t touch the piano for a day or a week? JFO: Oh, yes. Yes, it happens very often! [Laughs] Sometimes it happens when you’re on tour because you have to. It’s not because you choose to do it, but you have to travel, and sometimes you arrive and there’s no piano to practice. And in a way, sometimes that’s very healthy because you just get out and refresh your ideas and do something else! BD: Then how long does it take you to get back to full strength? JFO: Hopefully you’re prepared for it, so it’s not too long, really... A couple of hours. BD: Thank you for coming to Chicago. I’m very glad that we’ll get to hear your artistry. JFO: Me, too. I’m really thrilled to be here. It’s a wonderful city with a wonderful feeling. 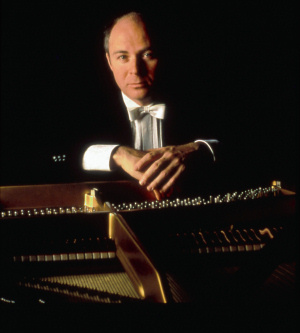 Recognized as one of the preeminent pianists of our time, Jorge Federico Osorio has been internationally acclaimed for his superb musicianship and absolute command of the instrument. 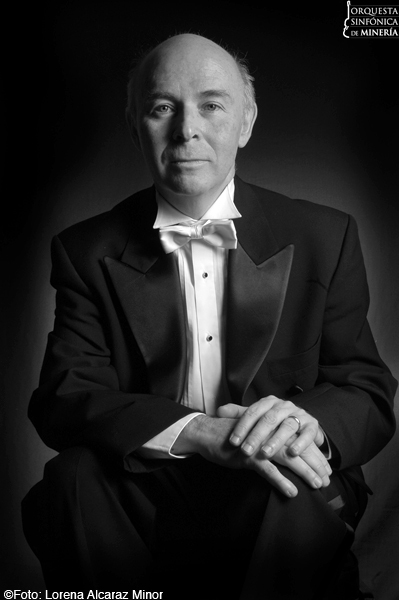 He has performed with many of the world’s leading orchestras, including the Chicago Symphony Orchestra, Dallas Symphony, Detroit Symphony, Concertgebouw Orchestra, Israel Philharmonic, Orchestre Nationale de France, Philharmonia Orchestra, Royal Philharmonic Orchestra, Moscow State Orchestra and Warsaw Philharmonic, under the batons of such internationally acclaimed conductors as Bernard Haitnik, Lorin Maazel, Klaus Tennstedt, Eduardo Mata, Lukas Foss, Enrique Batiz, and Luis Herrera de la Fuente. His concert tours have taken him to North America, Europe, Asia and Central and South America and American festival appearances have included the Hollywood Bowl, Ravinia and Grant Park Festivals. In addition to his recent triumphant debut with the Chicago Symphony Orchestra and his critically acclaimed Lincoln Center recital debut at Alice Tully Hall, Mr. Osorio has performed with the orchestras of Pasadena, San Antonio, Northbrook, and Delaware and with the Pacific Symphony Orchestra. He has made radio recordings for Japan NHK and Belgian Radio, and on several occasions, for the BBC. Mr. Osorio’s extensive discography includes a wide variety of repertoire. His solo Brahms recording on ASV was proclaimed by Gramophone as “one of the most distinguished discs of Brahms’ piano music in recent years.” IMP Classics has recently released his recordings of Beethoven’s Five Piano Concerti and Choral Fantasy, and in addition to his orchestral recordings of works by Brahms, Mozart, Rachmaninov, Schumann and Tchaikovsky, Mr. Osorio made the world premier recording of Manuel Ponce’s Piano Concerto. He has also recorded four Beethoven Sonatas and “Balada Mexicana”, solo piano works of Ponce. Born in Mexico, Mr. Osorio began his musical studies at the age of five. He studied at the conservatories of Mexico, Paris and Moscow, and his teachers have included his mother, Luz Maria Puente, Bernard Flavigny, Monique Haas, Jacob Milstein, Nadia Reisenberg and Wilhelm Kempff. 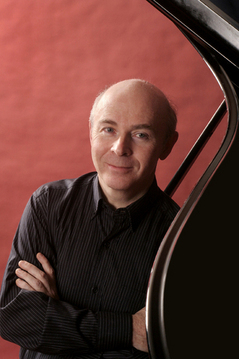 Performing chamber music is an integral part of his artistic life and in addition to having served as artistic director of the Brahms Music Festival in Mexico, he has performed with the Moscow Quartet, Tel Aviv Quartet, violinist Mayumi Fujikawa and cellist Richard Markson as part of a piano trio and with the late Henryk Szeryng. 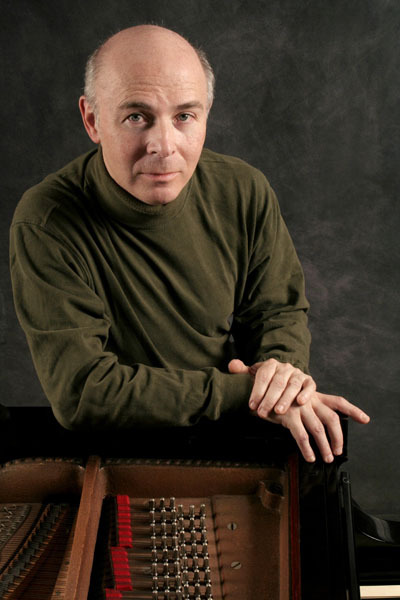 He is the recipient of several international prizes and awards, including the Rhode Island International Master Piano Competition and the Dallas Symphony Orchestra’s Gina Bachauer Award. This interview was recorded in Chicago on June 27, 1994. Portions (along with recordings) were used on WNIB in each of the following three years — 1995, 1996, and 1997. This transcription was made and posted on this website in 2009. It has also been included in the internet channel Classical Connect.